Second church building, built 1853. The First Christian Church of Sullivan met for the first time in 1840 at the log cabin of Levi Patterson near Asa Creek southeast of the present City of Sullivan. It was originally called the Christian Church of Asa Creek because Sullivan was not in existence. In 1846, the church was reorganized by Bushrod H. Henry, a traveling preacher and organizer of new Christian churches. Dr. A.L. Kellar was the minister. The congregation worshipped in a cabin school house which was also used as the Moultrie Courthouse. In 1852 a meeting was held in the Methodist church which was then the only church building in Sullivan. Ministers Bushrod Henry, John Wilson, and Manning Smith presided and 50 new members were added. The expanded congregation decided to build a church. A frame building, 40 by 60 feet, with one room and vestibule and tower was completed in 1853 at a cost of $2500.00. The bell in the tower, donated by David Patterson, is still present at the church today. 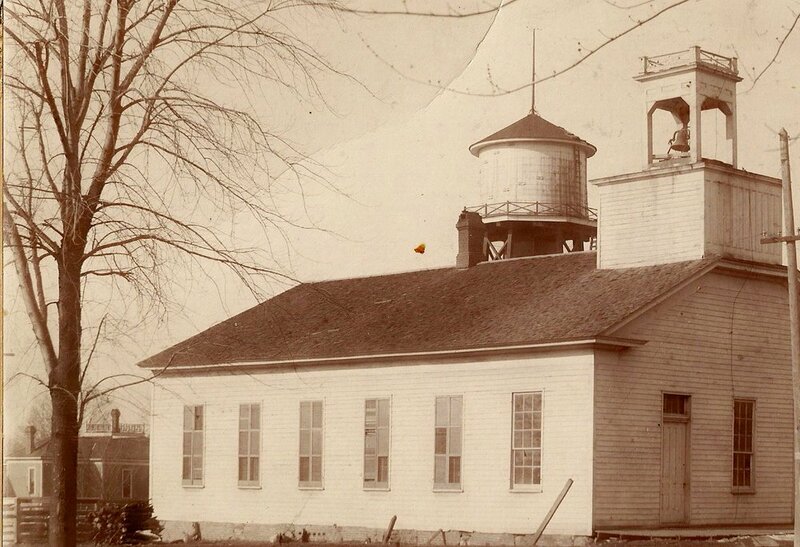 In 1899 the congregation outgrew the building and plans were made for a new structure. The 47 year old church house was town down and the Pifer brothers, Charles I. and Finley E., were hired to construct a new brick structure. This new brick building served the congregation for a number of years. Construction on a new brick building, c.1900. In 1940, the board authorized enlarging the basement to provide much needed space. Nine years later an educational wing was added. Growth of the congregation continued to cause the board to study plans to remodel or move. In 1970-71 plans were made to move to a new site and build a new church. On Pal Sunday in 1973 the congregation moved to the present new building located east of Sullivan. In 1976, in time for the Bicentennial, the Memorial Bell tower was erected. In 1973, the congregation moved to a new building east of town. The bell tower cross was constructed in 1976 as Agri–Fab’s first fabrication project. FCC held a very special worship service on July 4, as they dedicated their new bell tower. The tower holds the only bell the congregation had ever owned. The service opened with prayer, and then everyone went outside for the dedication service, during which the bell was rung for the first time at the church’s present location. Memorial funds were used to build the tower, and men of the church assisted with the installation. Recently, conversations began about the possibility of restoring the function of the bell. Through Memorial donations, as well as the efforts and research of a few kind volunteers, the bell’s function has been restored. When you arrive at church on Sunday, you will notice that the bell tower has been also been restored with a fresh coat of paint. Once again, the bell will continue to ring, signifying the gathering of God’s people in worship.